We utilize Graston Technique during headache treatment protocols. Many people who suffer from headaches have knots or trigger points in their neck muscles that contribute to headaches. In treatments with either deep massage or Graston Technique, scar tissue gets broken up. The fascial adhesions will break which produces inflammatory chemicals to be released. Deep muscle treatments can produce soreness or bruising after treatment. 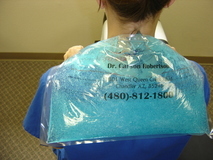 Icing after deep massage therapy or Graston Technique decreases the likelihood of soreness from the treatment. We recommend icing several times the day of treatment and several times the day after. Ice for 15 minutes to cool the area. Then take the ice off for 15 minutes and let the area warm up. Repeat this process several times. Icing should not be painful. People who ice more often always have less tenderness and soreness than people who do not ice. Not to mention, headache sufferers usually have less headaches if they do ice their trigger points and muscle spasms.